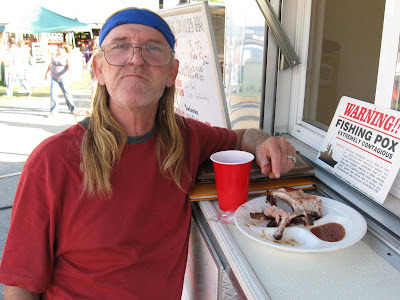 Ya Think This Feller Eating Ribs Might be Willie Nelson? I was down at the Rowan County Fair last night and met another barbecue master by the name of Jerry. Jerry is a traveling BBQ man. He hooks up his cooker and spreads the barbeque love across the state and beyond. 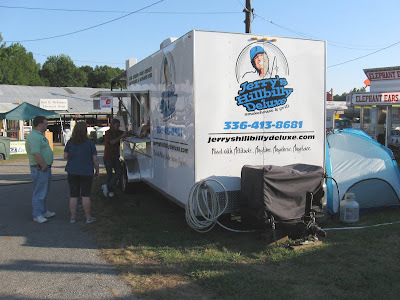 Jerry's traveling BBQ show is called Jerry's Hillbilly Deluxe. In addition to his big que cooker, Jerry also had his pull behind stand and even his tent out back. That's what I call eatin' and sleepin' barbecue. Jerry was smoking up some brisket and ribs. He also does big burgers, hot dogs, chicken, turkey legs . . . well . . . most anything you'd want smoked. He can hook you up with fries, cheese sticks and even "nanner puddin'" and strawberry shortcake. I don't hardly think this is a health food menu, but we're talking some darn good downhome Southern food. While I was chatting with Jerry I thought I'd get me a picture of some guy standing there eating ribs. He was eating faster than I could get my camera out, so you don't see much more than bones. Gives you an idea about how good these ribs taste though. When I asked the guy if I could snap a photo, he said "sure" and that he knew why I wanted his picture. I said, "Cause you're eating ribs?" He said, "Naw. I figured you wanted my picture, cause I look like Willie Nelson." I allowed as how he did look like old Willie (one of my favorite outlaw country singers of all time) and that I'd have an even better photo than I'd thought seeing as how I could claim I'd snapped Willie (or close). Jerry and I exchanged business cards as he was up to his elbows in sauce and stuff. I told him that I don't grill for business but do for fun and write about outdoor cooking. He said he'd check out my Grill Girl web page. I said I'd give his a look too. He said he'd had some tech problems. Tell me about that. Whew. Web pages can be a bear, and he doesn't have access to his. Has to pay a tech for every little change. Bummer. If you get a hankering for a big barbecue blow out and are in North Carolina or close, shoot Jerry a message on his Jerrys Hillbilly Deluxe web page or call him at 336-413-8681. Tell him Grill Girl sent ya and maybe you'll get some extra "nanners" in that pudding. I was very let down with this guy! Food wasn't good at all. And I believe he may have been drunk. The guy I met was 40 something and the food was great he just needed some help the line was long I think there were about ten people in front of me and when I got to the window there were ten or more behind me I overheard a lady in front of me ask about how long it took to cook his bbq and he said 16 to 18 hrs when I got to window he looked tired (this was day 4 of a 7 day event)10/08 in Fl.